#The course has been included in the list of reimbursable courses for Continuing Education Fund purposes. Six Sigma Institute is the only Examination Centre and authorized training centre for Certified Six Sigma Black Belt of the China Association for Quality in Hong Kong. What is Six Sigma? What is Lean? What is the relationship between them? Lean Six Sigma Black Belts are the core of Lean Six Sigma Scheme in Six Sigma organisations. They have developed a synergistic proficiency between technical discipline and the Six Sigma strategies, tactics, and tools. These individuals will continually work towards institutionalising the effective use of these tools throughout the corporation, its customers, and its suppliers. They also bear the responsibility of leading and driving projects with high business impact. This course provides a comprehensive cover of Lean and Six Sigma techniques that enable the participant to grasp the essential skills to lead Lean Six Sigma projects in their organisations. 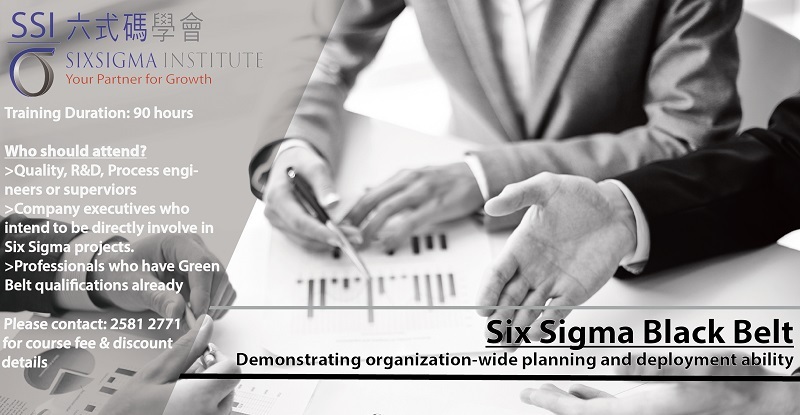 Through the coaching and in-class exercises, the participants receive practical experience from Six Sigma practitioners who hold the participants hand-in-hand to identify and implement the projects in the participants’ organizations. The Six Sigma Black Belt Certification Programme, conducted by Six Sigma Master Black Belts,contains afternoon seminars / workshops. The participant is required to complete at least one project with the close supervision of the Six Sigma Master Black Belt within 9 months after successful passing of the Black Belt academic examination. Quality, R&D, Process engineers or supervisors. Company executives who intend to be directly involve in Six Sigma projects. Professionals who have Green Belt qualifications already. Certificate of Black Belt in Six Sigma will be awarded to participants who have 70% or above attendance, complete all assignments, one group project and pass the examination. Certificate holders who complete at least one project with verified saving of HK$500,000 or an individual simulated project in SSI’s Six Sigma Project Course are eligible to be registered with the SSI as a Registered Six Sigma Black Belt or Registered Lean Sigma Black Belt and use the title of RSSBB or RLSBB after their names. 2. Administrative Charge for issuance of “Passing Certificate” (No Hidden Cost).